You’ve made the lunches, assembled outfits and packed the school supplies. Now it’s time to send your little genius off to start a new year at school! But hold off on walking them to the school bus — we can’t let you forget to capture some first day of school memories! 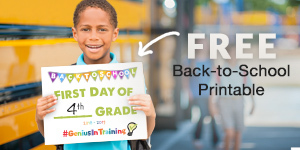 Download our free #GeniusInTraining printable, fill in your child’s grade and snap a picture. Post on Instagram and tag us @signupgenius — and don’t forget to use the hashtag #GeniusInTraining! Looking for more ways to organize back-to-school season? Browse these helpful ideas. Make classroom life a little easier for your child’s teacher by donating to — or setting up — their supply wish lists. Organize a carpool for your genius athlete with these tips and tricks and make the process simpler with a sign up! Help your mornings go smoothly by establishing a good morning routine with these tips. You’ll actually get out the door in time! Try these 10 tips to throw the best class party, especially if you volunteered to be room parent this year! Simplify the process by using a sign up. We know you’ll do genius things this year!